Like diplomatic missions of nearly every other country, the US Embassy has been in Tel Aviv, a result of the ambiguous legal status surrounding Jerusalem for more than a century. British forces captured the city from the Ottoman Turks during World War I and maintained control under a League of Nations mandate for 30 years. In November 1947, a United Nations plan terminated the British mandate for implementation at midnight May 14 1948, and partitioned Palestine into a Jewish state and an Arab state with Jerusalem to become an international zone. While accepted by the Jews, the proposed plan never was implemented as civil war erupted. The British organized their withdrawal and intervened only on an occasional basis. When a cease-fire ended the fighting in 1949, Israeli forces held Jerusalem's western precincts while Jordan occupied the city's eastern districts, including the old city with its holy sites such as the Church of the Holy Sepulchre, the al Aqsa Mosque and the Western Wall. Click here for more details and to see a map of the UN's original proposal. The State of Israel increased their area by almost 60% of the area that had been allocated to the proposed Arab state. This included the Jaffa, Lydda and Ramle area, Galilee, some parts of the Negev, a wide strip along the Tel-Aviv to Jerusalem road, and some territories in the West Bank, placing them under military rule. With Jordan occupying the West Bank and the Egyptian military occupying Gaza, no state was created for the Palestinian Arabs. Israel and Jordan soon annexed the portions of Jerusalem they held, with Israel in 1950 declaring the city as its capital, but this accordingly went unrecognized by other nations. In the 1967 Six-Day War, Israel captured East Jerusalem, along with the West Bank. Israel later annexed East Jerusalem and reunified the city, again an act that has gone unrecognized by the international community while Palestinian claims remain unresolved. FORTY years after the Six Day War, the consequences of Israel's extraordinary victory are yet to be sorted out. Israel was a tiny Middle Eastern backwater in 1967, with a population of 2.6 million surrounded by a hostile Arab world of 80 million. This disparity seemed to defy the natural order of things and it was a virtual consensus in the Arab world that the Jewish state would fall, sooner rather than later. In Israel itself, the enthusiasm and energy that marked the founding of the state out of the ashes of the Holocaust had been dimmed by the petty problems of getting by in a country with a massive defence burden and a lame economy. It was the Soviet Union, for reasons never adequately clarified, that lit the fuse that would transform the region. In mid-May 1967, it declared that Israel was massing troops in the north in preparation for an attack on Syria. Israeli prime minister Levi Eshkol offered to personally tour the north with the Soviet ambassador to show it wasn't true. The ambassador declined. There had been small-scale skirmishing between Israel and Syria over the headwaters of the Jordan and Israeli leaders had issued warnings, but there was no massing of troops. Egyptian president Gamal Abdel Nasser, the leading figure in the Arab world, felt impelled to come to Syria's aid by moving his divisions through the Sinai desert towards Israel. With a hostile army deploying on its border, Israel mobilised its reserves. Nothing happened for more than two weeks. But mobilisation had paralysed the Israeli economy and Jerusalem had to either stand down or strike. On the morning of June 5, Israeli planes, flying low to avoid radar, suddenly rose into the Egyptian skies. Within three hours, the Egyptian air force was destroyed. Soon after, the Jordanian, Syrian and part of the Iraqi air forces were gone, too. On the third day of the war, the West Bank and Jordanian Jerusalem fell. Syria's Golan Heights followed. The Arab world was stunned, Israel euphoric. The war catapulted Israel into a new era. Brimful of self-confidence and renewed energy, it attracted Jewish immigrants from the West and more than a million from the Soviet Union. Since 1967, Israel's population has tripled to 7.1 million (of whom 1.4 million are Israeli Arabs), its gross national product has grown by 630 per cent and per capita income has almost tripled to $21,000. A major result of the Six Day War was to persuade the Arab world that Israel was too strong to be defeated. Internalising that view, Nasser's successor, Anwar Sadat, became in 1970 the first Arab leader to declare readiness to make peace with Israel if it withdrew from all territory it had captured in the Six Day War. Israel insisted, however, on territorial changes. It took the 1973 Yom Kippur War to persuade Israel to withdraw from all Egyptian territory and for Egypt to agree to peace without insisting on Israel's withdrawal on other fronts as well. The Oslo accords in 1993, marking the beginning of a dialogue between Israel and the Palestinians, also enabled Jordan to make peace with Israel without being accused of betraying the Palestinian cause. In 2000, Syria announced its readiness for peace. 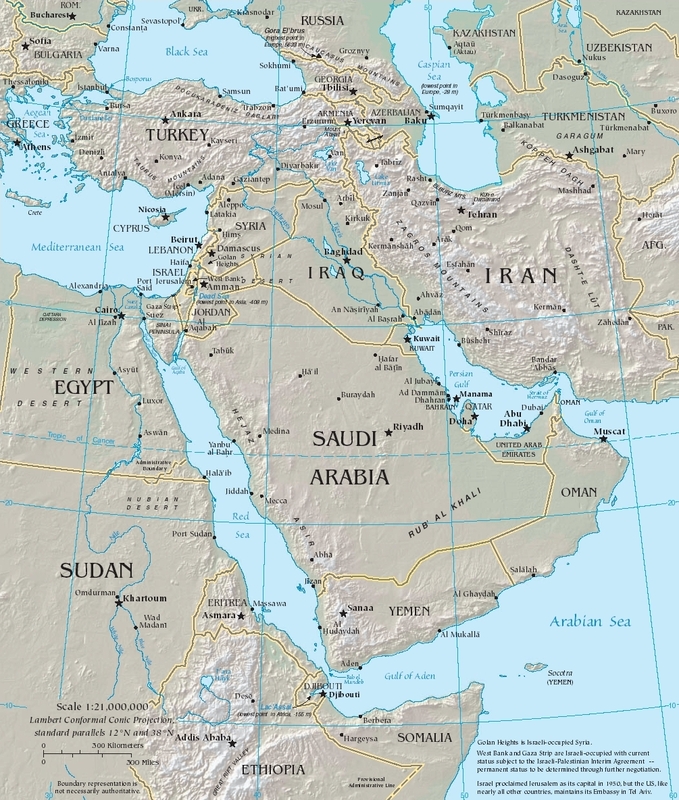 Though negotiations with Damascus broke down, virtually the entire Arab world now accepted the legitimacy, or at least the existence, of the Jewish state in its midst. But increasing radicalisation has brought to the Palestinian leadership a movement dedicated to Israel's destruction. If there is an answer for Israel, it lies, as in 1967, in bold and imaginative leadership — but this time on the political playing field. The barrier route as of July 2006. Seven years after construction work began on the West Bank separation fence, the project seems to have run aground. Work has slowed significantly since September 2007. With fierce opposition coming from the United States, Israel has halted work on the "fingers" — enclaves east of the Green Line that were to have included large settlement blocs such as Ariel, Kedumim, Karnei Shomron and Ma'aleh Adumim, within the fence. The military has, in practice, closed up the holes that were to have led to these "fingers." 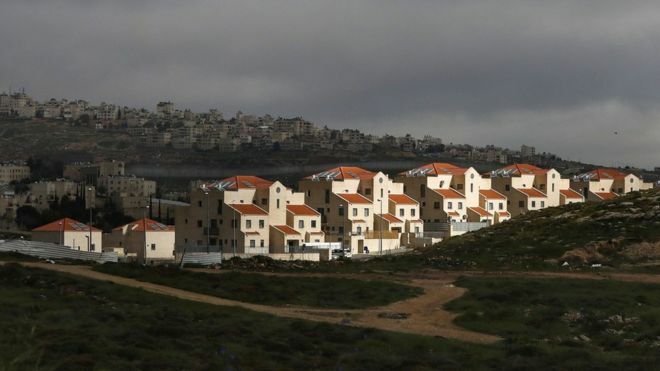 But giant gaps remain in the southern part of the fence, particularly in the southern outskirts of Jerusalem, in the Etzion bloc and in the Judean Desert. Since the cabinet under former prime minister Ariel Sharon first approved construction of the fence, in June 2002, the route has undergone some dramatic changes. The original route, which was inspired by Sharon, was to have effectively annexed about 20 percent of the territory of the West Bank to Israel. 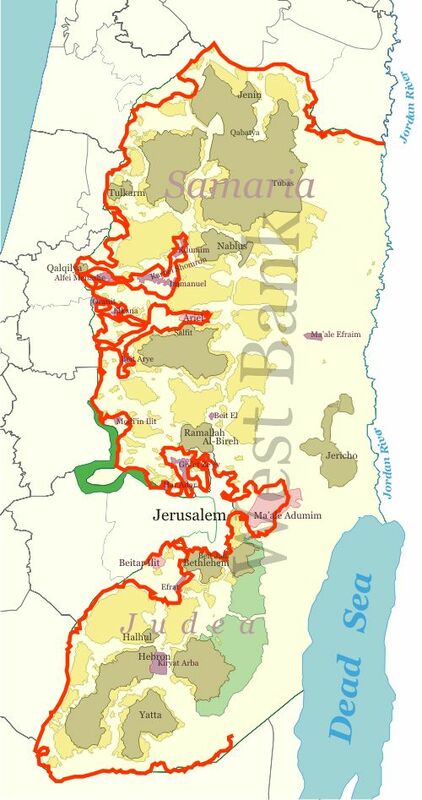 In February 2005, the cabinet amended the route to include just nine percent of the West Bank. In April 2006 an additional one percent was shaved off by the government of Ehud Olmert. In practice, however, the route encompasses only 4.5 percent of West Bank land. The four "fingers" in the last map (and which Israel presented at Annapolis in November 2007) were never built, not at Ariel and Kedumim (where a "fingernail" was built, a short stretch of fence east of the homes of Ariel) — not at Karnei Shomron and Immanuel — not at Beit Arieh, nor south of that, at Ma'aleh Adumim. Instead, with little publicity, fences were put up to close the gaps closer to the Green Line, at Alfei Menashe instead of at Kedumim, at Elkana instead of Ariel and in the Rantis area instead of at Beit Arieh. About 50,000 people in these settlements remain beyond the fence. West of Ma'aleh Adumim the wall built along Highway 1 blocks the gap in the barrier and leaves the city's 35,000 residents outside of the barrier, forcing them to pass through a Border Police checkpoint in order to reach Jerusalem. Large gaps remain in the southern West Bank. Between Gilo in south Jerusalem and Gush Etzion are tens of kilometres of barrier, work on which was suspended due to High Court petitions. As a result access to Jerusalem from the direction of Bethlehem (now a part of the Palestinian Territories) is relatively easy — for commuters and terrorists both. Click here for some news in Sep 2014. A second, 30-kilometre gap in the fence, stretches from Metzudat Yehuda (Yatir) in the west to the Dead Sea in the east. The state announced during a recent High Court deliberation of a petition submitted by area Bedouin that work on the barrier there was suspended. Defence Minister Ehud Barak is "determined to complete the security fence, despite the delays," his office said in a statement. "The minister and the military establishment are working to solve the problems delaying its completion." Defence Ministry officials pointed out that Barak was "among the first supporters of the fence and did much to advance its construction." Security officials claim the rate of construction depends on finding a solution to the legal issues and point out proudly that there is an unbroken barrier from Tirat Zvi in the Beit She'an Valley (in Northern Israel, just west of the Jordan River) to the southern entrance to Jerusalem, and from southern Gush Etzion (south west of Jerusalem) to Metzudat Yehuda (south east of Hebron). Click here for an article on East Jerusalem published by the Australia/Israel & Jewish Affairs Council (AIJAC) in mid 2011. 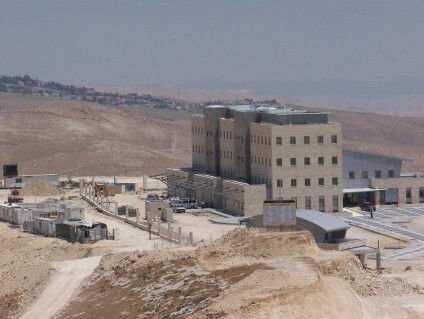 Finally, after years in the planning, construction of an Israeli police station is under way in the now infamous E1 area, 12 square kilometers, a patch of empty West Bank land that stretches from the eastern municipal boundary of Jerusalem to the settlement-city of Ma'ale Adumim, which sits across the Jerusalem-Dead Sea highway some five kilometers (three miles) to the east. 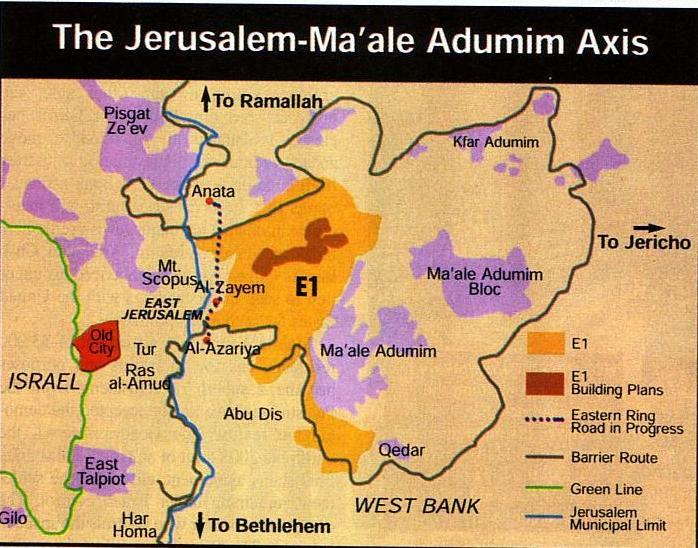 Infamous, because every prime minister of Israel for the past decade has wanted to develop E1 in order to fill in the space between Ma'ale Adumim and Jerusalem, with the intention of securing Israel's hold over the settlement and its smaller satellite communities, which together constitute the Ma'ale Adumim settlement bloc. And every US administration up until now has nixed Israeli development here, on the grounds that it would seriously hamper Palestinian territorial contiguity between the north and south of the West Bank, as well as access from the West Bank to Jerusalem, thereby undermining the viability of a Palestinian state with East Jerusalem as its capital, the only realistic formula on the table for Israeli- Palestinian peace. are no residential areas around it. That will hopefully soon change. The Israel and Egypt — Gaza Strip barrier is a separation barrier first constructed by Israel in 1994 between the Gaza Strip and Israel. An addition to the barrier was finished in 2005 to separate the Gaza Strip and Egypt. The fence runs along the entire land border of the Gaza Strip. It is made up of wire fencing with posts, sensors and buffer zones on lands bordering Israel, and concrete and steel walls on lands bordering Egypt. Background: The Gaza Strip borders Egypt on the south-west and Israel on the south, east and north. It is about 41 kilometres long, and between 6 and 12 kilometres wide, with a population of about 1.5 million people. The shape of the territory was defined by the 1949 Armistice Agreement following the creation of Israel in 1948 and the subsequent war between the Israeli and Arab armies. Under the armistice agreement, Egypt administered the Strip for 19 years, to 1967, when it was occupied by Israel in the 1967 Arab-Israeli War. In 1993, Israel and the Palestinian Liberation Organisation signed the Oslo Accords establishing the Palestinian Authority with limited administrative control of the Palestinian territories. Pursuant to the Accords, Israel has continued to maintain control of the Gaza Strip's airspace, land borders and territorial waters. Israel started construction of the first 60 kilometres long barrier between the Gaza Strip and Israel in 1994, after the signing of the Oslo Accords. 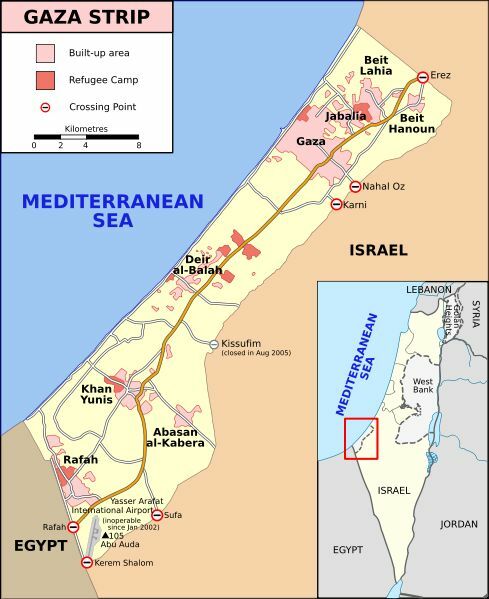 In the 1994 Interim Agreement on the West Bank and the Gaza Strip, it was agreed that "the security fence erected by Israel around the Gaza Strip shall remain in place and that the line demarcated by the fence, as shown on the map, shall be authoritative only for the purpose of the Agreement" (ie. the barrier does not constitute the border). The barrier was completed in 1996. The barrier was largely torn down by Palestinians at the beginning of the Al-Aqsa Intifada in September 2000. The barrier was rebuilt between December 2000 and June 2001. A one-kilometre buffer zone was added, in addition to new high technology observation posts. Soldiers were also given new rules of engagement, which, according to Ha'aretz, allow soldiers to fire at anyone seen crawling there at night. Palestinians attempting to cross the barrier into Israel by stealth have been shot and killed. Israel has settled about 400,000 Jews in West Bank settlements, with another 200,000 living in East Jerusalem. There are about 2.5 million Palestinians living in the West Bank. Palestinians want to establish a state in the occupied West Bank, East Jerusalem and the Gaza Strip. What happens to the settlements is one of the most contentious issues between Israel and the Palestinians — Palestinians say the presence of settlements makes a future independent state impossible. "You are asking whether we are moving on to the next stage — the answer is yes, we will move to the next stage," he said. "I am going to extend [Israeli] sovereignty and I don't distinguish between settlement blocs and the isolated settlements." 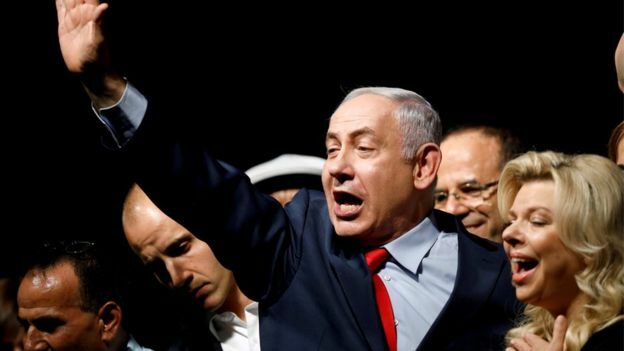 Senior Palestinian official Saeb Erekat said the statement by Mr Netanyahu was "not surprising". He added: "Israel will continue to brazenly violate international law for as long as the international community will continue to reward Israel with impunity, particularly with the Trump administration's support and endorsement of Israel's violation of the national and human rights of the people of Palestine." These comments by Benjamin Netanyahu are potentially explosive over an issue that has helped stall peace efforts for years. They will resonate with several parties with which he'll try to form a coalition government if he wins the biggest share of votes.